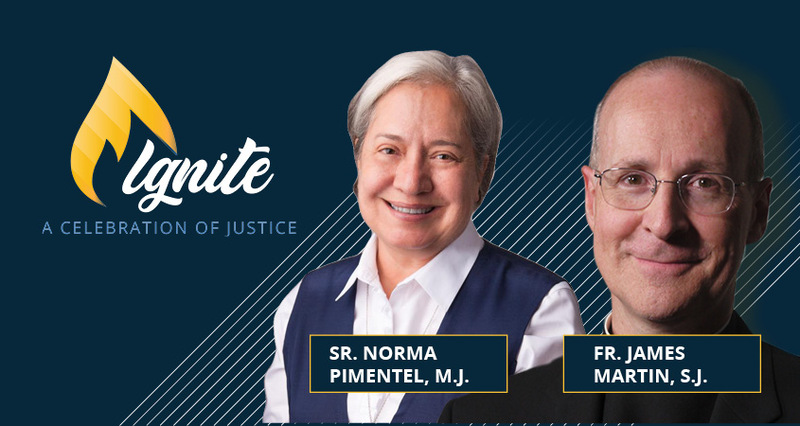 Commemorating fifteen years as an organization promoting a faith that does justice, the Ignatian Solidarity Network announces the first annual Ignite: A Celebration of Justice to be held on May 21, 2019, in New York City. Highlighted at the event will be honorees receiving three awards: the Robert M. Holstein Faith Doing Justice Award, the Legacy of the Martyrs Award, and the Moira Erin O’Donnell Emerging Leaders for Justice Award. The Robert M. Holstein Faith Doing Justice Award will be given this year to Rev. James Martin, S.J., and Sr. Norma Pimentel, M.J. The Holstein Award honors individuals who have demonstrated a significant commitment to leadership for social justice grounded in the spirituality of St. Ignatius of Loyola, the founder of the Society of Jesus (Jesuits). The award’s namesake, the late Robert Holstein, was a former California Province Jesuit, labor lawyer, a fierce advocate for social justice, and one of the founders of the Ignatian Family Teach-In for Justice (IFTJ)—the precursor to the Ignatian Solidarity Network. Fr. James Martin, S.J., at the 2017 Ignatian Family Teach-In for Justice. Fr. Martin is a Jesuit priest, author, and editor at large at America, the national Catholic magazine. His most recent book is titled Building a Bridge: How the Catholic Church and the LGBT Community Can Enter into a Relationship of Respect, Compassion, and Sensitivity . He is a frequent commentator in the media about issues of religion and spirituality and is known for his appearances on The Colbert Report and his robust social media presence. Fr. 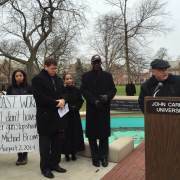 Martin has established himself as a powerful voice for justice. He is a sought-after speaker at parishes and institutions across the U.S. on LGBT inclusion in the Catholic Church. He utilizes his significant online reach as an advocate on behalf of those who migrate, contributing to the Catholic Church’s work to build a culture of care and compassion that upholds the dignity of all immigrants and refugees. Fr. 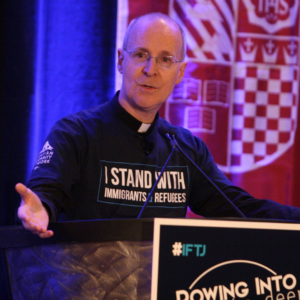 Martin has served as keynote speaker and breakout presenter at the Ignatian Family Teach-In for Justice. 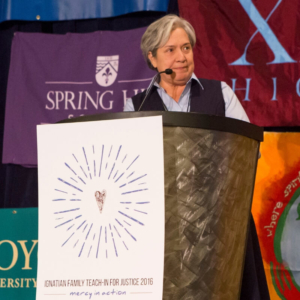 Sr. Norma Pimentel, M.J., during her keynote address at the 2016 Ignatian Family Teach-In for Justice. Sr. Pimentel is the executive director for Catholic Charities of the Rio Grande Valley in McAllen, Texas. In this role, she oversees the charitable arm of the Diocese of Brownsville, providing oversight of the different ministries and programs in the areas of emergency assistance, housing assistance, military family relief, clinical counseling, and pregnancy care to all four counties in the Rio Grande Valley. In recent years, she has been instrumental in quickly organizing community resources to respond to surges of Central Americans seeking asylum in the United States and setting up Humanitarian Respite Centers in McAllen, Texas. 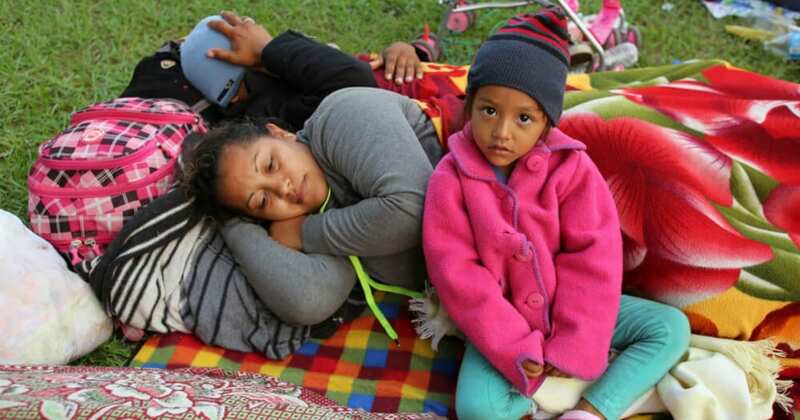 These efforts have captured the world’s attention, drawing news media from around the globe to cover the plight of these desperate Central American refugee families, and compelling thousands of individuals from this country and others to contribute their time, talents, and treasures to serve and support them. Sr. Pimentel was a keynote speaker at the 2016 Ignatian Family Teach-In for Justice. ISN will present the Legacy of the Martyrs Award at the event to The Center for Undocumented Students at Saint Peter’s University. The award honors individuals or organizations who have made significant contributions to sustaining the witness and legacy of the Jesuit martyrs and their companions. 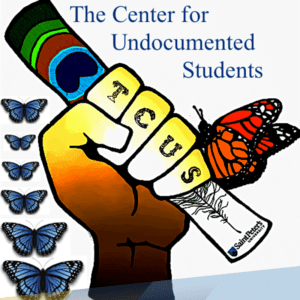 Since 2014, The Center for Undocumented Students (TCUS) has supported undocumented students at the university, shedding intellectual light on the political and economic realities of immigration in our world today and creating a community where undocumented students feel welcome. Under the leadership of Jennifer Ayala, Ph.D., TCUS offers access to legal support, a resource library, academic advising, career mentoring, and financial aid guidance, and provides a safe space for undocumented students. Ongoing collaboration with other university departments and outside organizations provide opportunities for faculty and staff workshops, pro-bono legal and counseling services, and connection to other community services. The work of TCUS sustains the legacy of the martyrs— the six Jesuits and two laywomen—who were killed for their commitment to upholding the dignity of the oppressed. Two young alumni of Jesuit universities, Eric Clayton (Fairfield University ‘11) and Meaghan Fanning (Rockhurst University ‘12), will also be recognized at the event with the Moira Erin O’Donnell Emerging Leaders for Justice Award. Clayton is a Catholic Relief Services senior program officer in the organization’s new Mission and Mobilization division. Fanning is the manager of the refugee services youth program for Jewish Vocational Service in Kansas City. The award is given in memory of Moira Erin O’Donnell who had served as ISN’s executive director for less than a year when she passed away suddenly and unexpectedly at the age of 33. 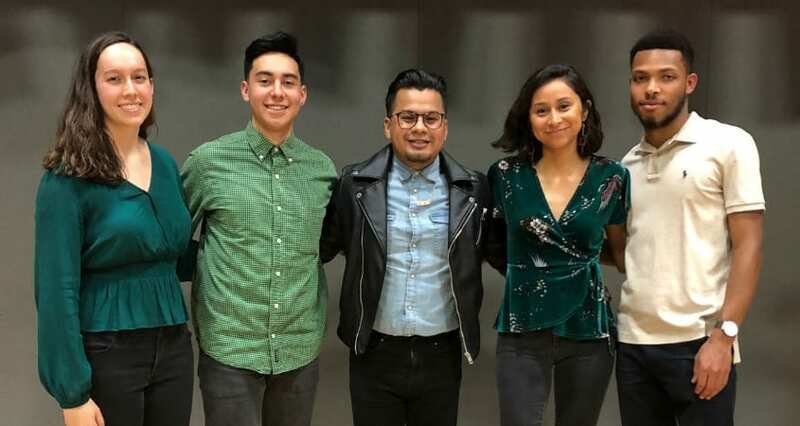 The annual award honors individuals ages 23-33 who have received an undergraduate degree from a U.S. Jesuit university and have demonstrated significant social justice leadership in their communities. Honorary committee members for this year’s event include Very Rev. John J. Cecero, S.J. ; Eugene J. Cornacchia, Ph.D.; Rev. Dan Corrou, S.J. ; Very Rev. Timothy Kesicki, S.J. ; Rev. Daniel Lahart, S.J. ; Rev. Matt Malone, S.J. ; Sr. Donna Markham, O.P. ; Ph.D., Rev. Joseph M. McShane, S.J. ; Sr. Virginia O’Brien, S.U. ; Tony Oroszlany; Jack Raslowsky; Joan Rosenhauer; His Eminence, Joseph William Cardinal Tobin, C.Ss.R. ; Rev. Dennis J. Yesalonia, S.J. ; and Sr. Carol Zinn, S.S.J. Prior recipients of the Robert M. Holstein Faith Doing Justice Award include Fr. 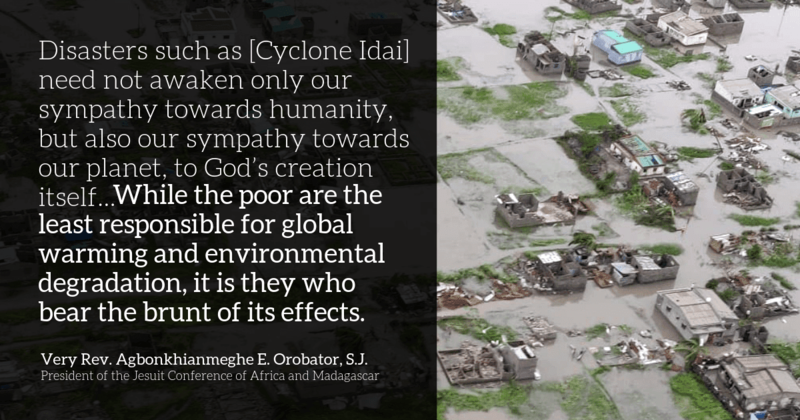 Gregory Boyle, S.J. ; Fr. Michael Garanzini, S.J. ; Sr. Carol Keehan, D.C.; Sr. Helen Prejean, C.S.J. ; and Fr. Charlie Currie, S.J.Please visit the Ignite: A Celebration of Justice website to learn more about the awards and event, explore sponsorship opportunities, and purchase event tickets. Where Did I Find the Magis? Hearty congratulations. Working for justice adds life to our lifespan. God bless.